Congratulations again to Leda for the win. Leda had 2 1st and a 2nd, Papoose 2 2nd and a 1st, Ole 3 3rd. 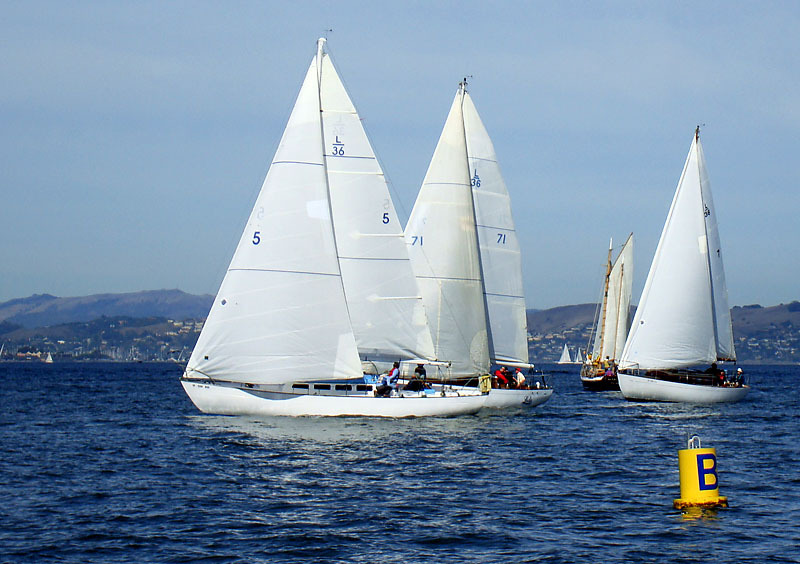 Papoose had a few things set up wrong and Leda sailed a couple of great races on the first day. The third day saw rain and overcast but we went out anyway. Leda engaged us in a little match racing at the start to punish us for insisting we go out. We caught them just before the second mark and passed never to be caught. We realized we cannot point as high as Leda with their aluminum rig and hydraulic backstay and quit trying on the second day. That helped us a great deal. They are a tough competitor and again congratulations on the win. Here is a shot of Papoose at the start, fighting traffic from boats from another class but our same start time. Click Here for results. Finish order was Papoose (1st), Leda, Ole, Eventide. It was a very exciting finish for us with the lead changing 3 times on the last leg. HERE is the short write up from "Lectronic Latitude"
Congratulations to David James (once again). David sailed a great race. We were close at the start but David just out sailed us on the second leg. We gained ground down the city front but it wasn't enough. The rest of the race was fairly even. David is a wonderful sport in addition to being a wonderful sailor and gave us several tips after the race which we will incorporate so that we can be more competitive next year. Ole made the same mistake we made last year by tacking right at Little Harding. The current across that part of the bay, at 1.8 knots on Saturday, takes you so far away from the mark at Crissy Field that it is like sailing an extra leg. It is tempting to do because of the current relief along the city front but it just doesn't seem to work out the way you think it should from the tide charts. Eventide had two goals, have a good start, sail the course, and finish. They certainly had a good start bring right at the line at the gun, they sailed a good race, and they finished. Mission accomplished! The raft up and the party after the race were great. My hat is off to everyone who organized the event. This year there were three races. Leda, Papoose, and Ole showed up. Next year we hope to have 5 boats in the class with the new owners getting their boats fixed up between now and then. 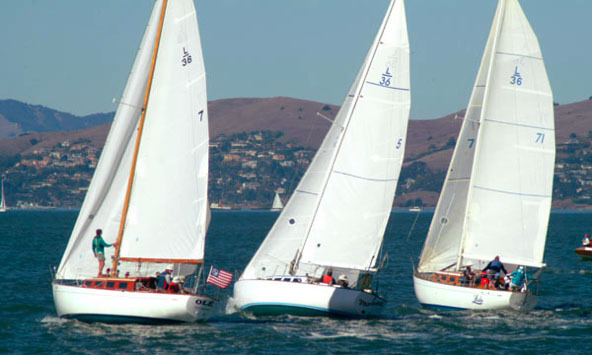 The first race was once around a course starting at the St Francis, going to near the south tower of the GG bridge, then over to Angle Island, to Ft. Mason, then back to the start line. Leda got the best start and held that lead to the end. On the second race, Papoose got off first and was able to finish first after two times around the same course. Sunday saw Papoose and Leda tied with 3 points each. Ole had 6 so was basically a spectator and went home after starting. The course was also two times around. The race between Papoose and Leda was extremely exciting with the lead changing many times. Papoose was ahead by 4 boat lengths around the last mark but ran into traffic from two of the other races forcing a duck and a couple of extra tacks. Leda cleverly stayed out of the traffic and won by 0.05 seconds (6 inches). Congratulations to Leda on the win. Papoose took the second and Ole was awarded third. We all got very nice fleece vests. Results for the 2008 regatta are now online. Congratulations to Leda for the win, Ole for the place, and Papoose for the show. The three boats finished within 1:21 of each other. The last leg saw Leda pass Ole in a tacking dual that was something to behold. 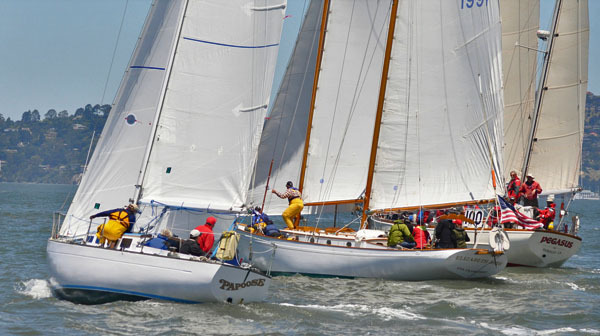 Another exciting moment was the rounding of the first mark which saw Leda's bow 4 inches from the end of Papoose's boom. Papoose had a disasterioius second leg that cost her over 100 boat lengths which proved too much to overcome. When you are ahead of a boat, don't tack away. Don't tack into the current. Pick a sail for the conditions on the water, not the report on the radio. Pictures shot from Papoose mostly of Leda who happened to be very close at the time are HERE. 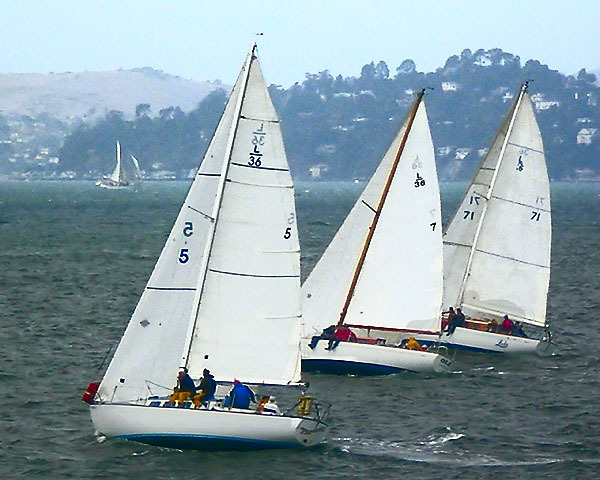 Check out This Article for a great writeup on the race from norcal sailing. In addition to my crew, I would like to thank Don Teakell of Quantum Sails for all the time and effort he put in to getting my sails right. I would also like to thank David James for all the advice he gave me on sail selection. Thanks to Paul Harris of Quantum for sailing with us and teaching us a thing or two. My only regret was the incident around one of the marks with Leda II. I still don't know what happened and who was right. I am just glad they didn't hit us. If I was in the wrong, I apologize. I am also pleased and surprised we didn't collide with Ole around one of the other marks. I don't know what happened there either, I just know all of a sudden there was a boat very close and I thought I would either hit them with my bow if I didn't change course, or with my stern if I did. John said it was his fault and they did a 360. Like I said, I have no idea but in any event, no hard feelings. As a result of these incidents, I have studied up on the rules below. An interesting side note is that in this race, if you break a rule, you cannot undo it with a normal 720 degree penalty turn (Jessica Cup rule). The only recourse is a protest (which are discouraged) and the outcome of a successful protest would have been 1 point pentalty (20 percent rule). None of the results would have changed so I am glad we didn't hit anyone and realized we are all trying to do our best with limited racing experience.